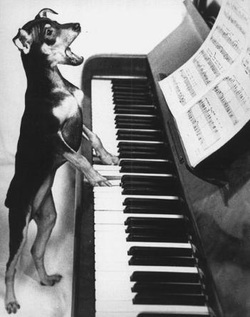 Several years ago I visited one of the Los Angeles players and was amazed to see his pooch playing and singing at the piano. But imagine my surprize when the man said the dog also played Checkers! "I can't believe it! He is probably the smartest dog in the whole world!!!" I said. "Nah, he's not so smart," my friend replied. "I've beaten him three games out of five."